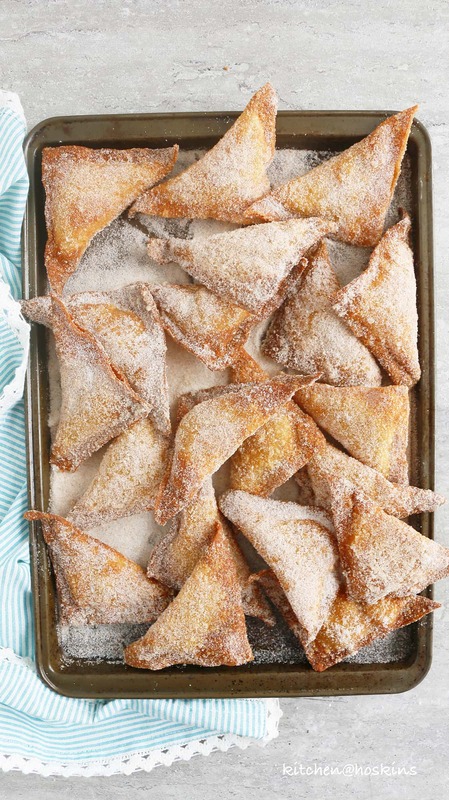 Light, crisp cinnamon sugar coated wonton shells stuffed with an amazing pumpkin filling! 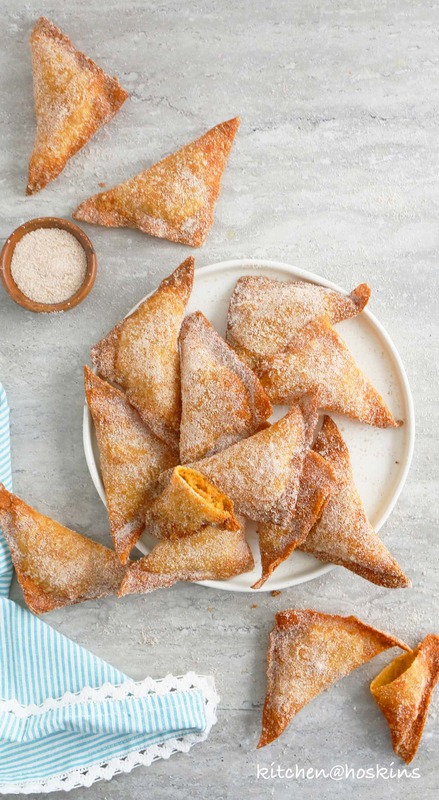 Pumpkin Churro wontons makes a delicious dessert or snack for your next holiday party or get-together. Could there be anything better than a shattery crisp shell with a creamy pumpkin filling and then covered in a layer of cinnamon sugar? 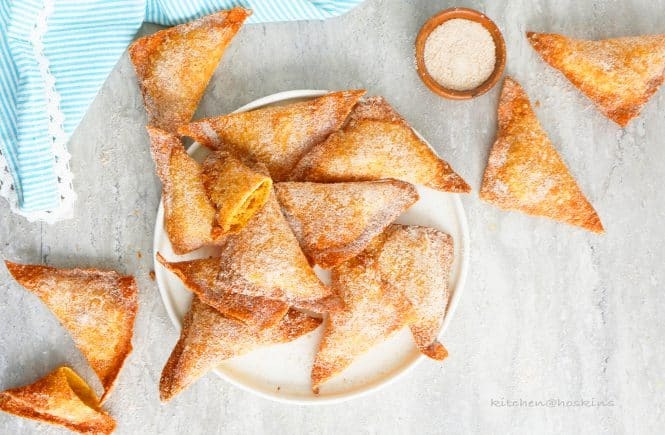 These are the ultimate dessert, snack or just with a cup of coffee. These might not be a lunch box candidate, but it’s the holidays. PARTY TIME. 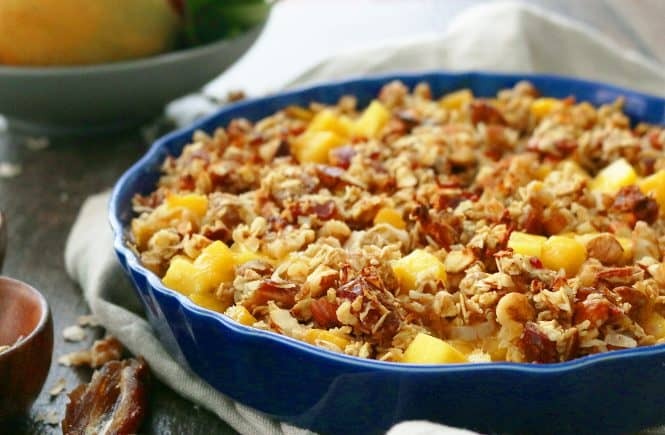 We’ve loved these so much that it was once our weekend breakfast. 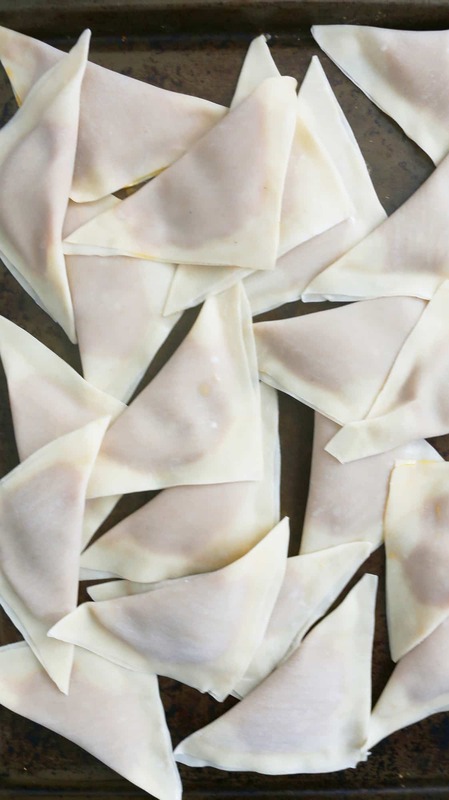 I love how versatile wonton wrappers are. 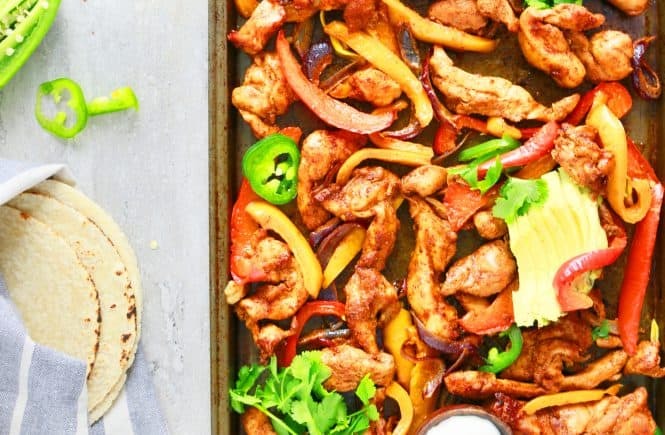 Like these BBQ Chickpea Wonton Nachos <— Best game day munchy. 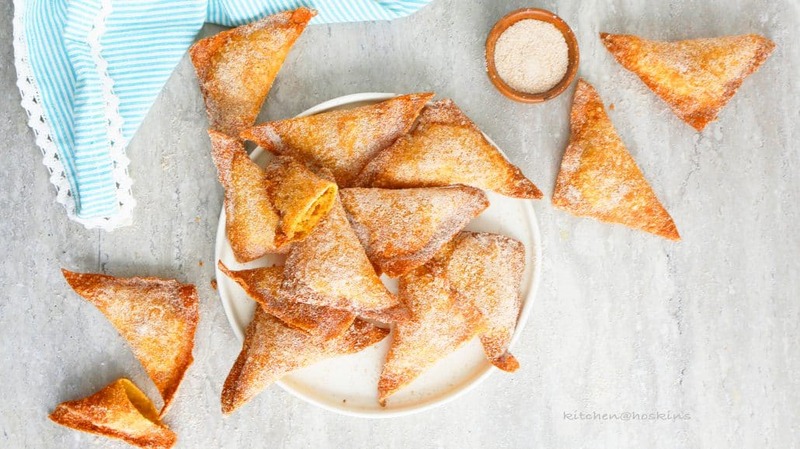 Shall we get to the process of making these pumpkin churro wontons? 1.Make pumpkin filling (stir pumpkin puree, egg, brown sugar, flour, cinnamon and salt, until combined). 3.Deep fry until golden brown. 4. Dredge in cinnamon sugar. 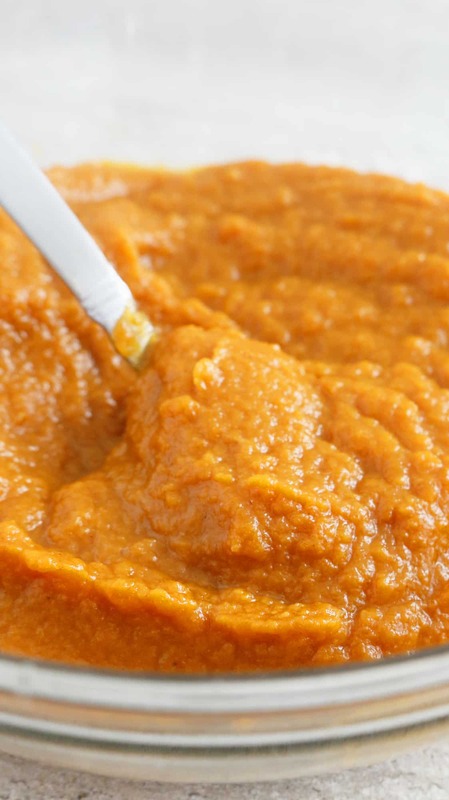 Mix all pumpkin filling ingredients in a medium bowl, until smooth and set aside. Stir sugar and ground cinnamon together in a large bowl and set aside. Have a small bowl with water handy. 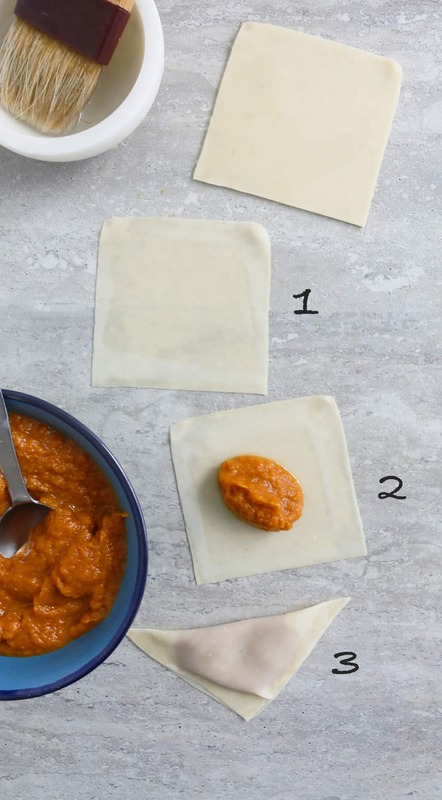 Place a wonton wrapper on the work surface and place a scant tablespoon of pumpkin filling in the middle. 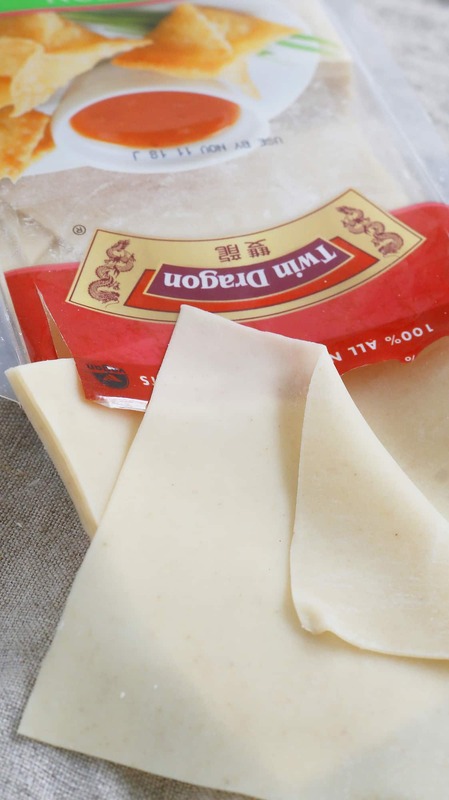 Using a pastry brush or just your finger, wet all four sides of the wonton wrapper with water (not dripping wet) and then close to form a triangle. Press edges well to seal. Repeat process to form remaining triangles. 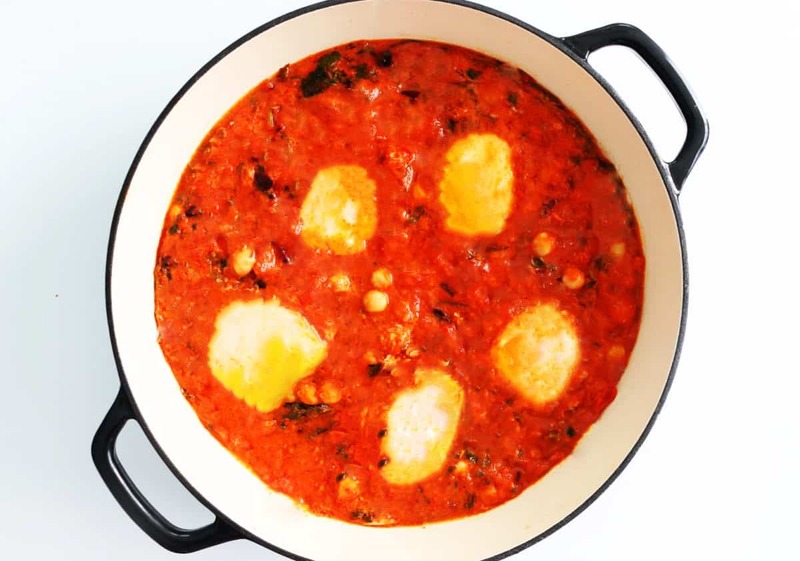 Pour vegetable oil into a large pan, until it reaches about 1 and 1/2 inches in height. Place over medium high heat and let it get moderatly hot (about 325 degrees F). Deep fry about 4-6 triangles at a time,until golden brown on both sides, turning occasionally (about 3 minutes per batch). Drain on a paper towel lined plate. 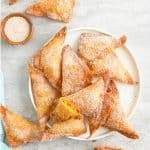 Proceed with the next batch and in the mean time, dredge both sides of the fried batch of wonton triangles in cinnamon sugar and place on a serving platter. Dredging hot fried pumpkin churro wontons in cinnamon sugar will help in the sugar to adhere well. So, I recommend dredging one batch, when the next batch is being fried. Great minds think alike!! Between your pumpkin pie wontons and my sweet potato pie wontons, we got pies covered for the holidays hehehehe. Looks so yummy!! !